If you love bourbon this app is a must have. I'm just starting to drink bourbon after years of scotch drinking. This app is so useful for learning about new bourbons, keeping track of what you've had, and planning what you want to try. Ratings are fairly meaningless. Who knows what someone's likes & dislikes are. No frame of reference. Generally pretty good, but does lack newer bourbons and special releases. Not much more than a listing of available bourbons. Great app!! 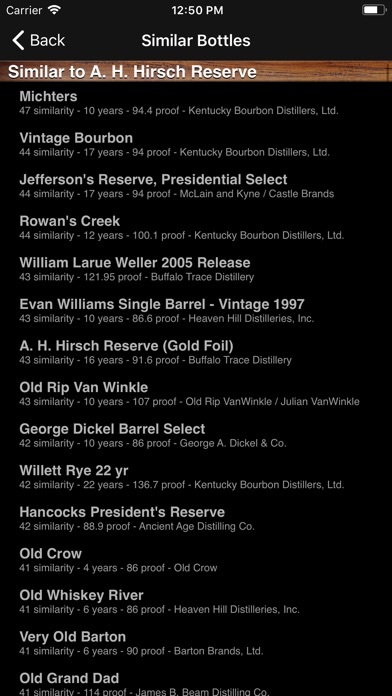 View bourbons by name, bottler, rating, age or by your own tags. U can enter your own tasting notes & view your list of bourbons. Also can read reviews by others. 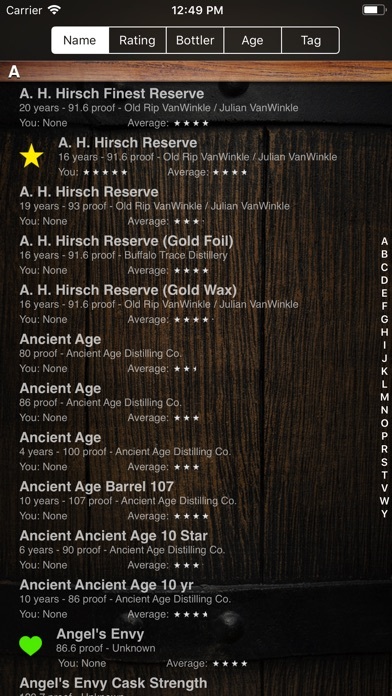 It's great enough to have a list of bourbons, but this app gives so much more! For fans of the finer beverages, this app "Rocks". Or should I say "It's Neat!" Elegant interface helps us understand this liquid, golden spirit. Has helped me discover new tastes. I enjoy all of the reviews. Overall, this is a nice app. Wish it would let me add reviews for specialty bourbons like Knob Creek Single Barrel. Otherwise it's a very good app for bourbon lovers, excellent handy reference. I like the exhaustive list of bourbons and I agree with most of the ratings! I live the idea of keeping tabs on the whiskey I have had! This is fun. Don't expect everyone to have the same tastes I have...but, hey, I could be engaged in worse activities right now. A must-have for any die-hard bourbon drinker! Great companion in the liquor store while choosing what to buy. This is a great app to learn about different bourbons. Some people think that other people's opinions are useless, but sometimes that is how people learn. Apps like this help me learn about bourbons through other people's tastes. This is a good place to start for anyone who wants to try bourbons. 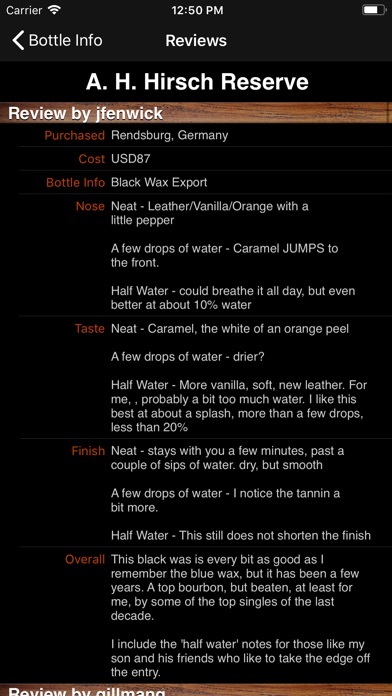 Very good app, I like to review prior to buying new bottles. I wish there was a "have it" tag to help keep track of bottles I already have. I would give this App a 4 star but they don't update new bourbons enough, and the interface is rather annoying. Reading fun for the bourbon lover. Some really great bourbons and tools for designing your "must try" list. You can waste so may hours especially if you sample the bourbons while reasing the reviews. Missing images. Only has common bourbon. Special releases or high end bourbons not even on this app. Disappointed. Great instant info on bourbons that aren't "mainstream." I love the reviews and comparisons to bourbon I am already familiar with; it allows for really educated purchases. There are some curious absences like Makers Mark 46. Great on the go, but would get 5 stars if there was more info on the distilleries. Thanks! Probably the best bourbon/whiskey app on the market, but still needs improvement. Needs a scanning option. Haven't been any significant improvements in a few years. Bourbon taste different each release. The app needs to be updated more often. Easy to use. Full of great information and opinions. A great tool for a novice like me. The UI messes up when you search via the search bar. Also, a nice idea would be to add an average price per bottle on the main page as opposed to having to drill down into the individual reviews. I do like that it's a great source when I'm in a liquor store looking for a new, solid bourbon to try. Great app, but still lacks many brands. I absolutely love the interface and features but lacks many of the great whiskeys that are currently in my collection. This app has so much potential. I will update my review when more updates become available. Excellent source to refer when uncertain about selection. Love the app, however there are a handful of great labels missing. Would also love to have a way to save my database to the cloud. When I restore or upgrade my phone all my entries will be erased.. Overall I think it is a great app for what it is and that is a database for bourbons. It could use some more details on mashbills and history but there are other web resources for that. There is a review by a 'mike' on almost every freaking bottle. It's BS. No way this guy is consistently trying all of these obscure bourbons. It would take years to try all the ones 'he' reviews. And if he tried one a year or 4 ago, no way 'he' would remember exactly what the 'nose' is like. So I feel the reviews might be fake. But I do like how much info on all the obscure bourbons. GET RID OF ALL THE FAKE 'MIKE' reviews and I'll change my rating to 5 stars!! Good reference app when your stuck at the liquor store other than that eh. Love it! Wish I could learn more about specific qualities. Great way of learning about bourbon, love it. If you are a bourbon drinker or just someone that enjoys a glass, then this is your kind of app. I've learned more of all the varieties of bourbon and look forward to sampling more and and more bourbon. I like bourbon review.. keeps me informed on new ideas. It doesn't appear that anyone is keeping this app up to date. 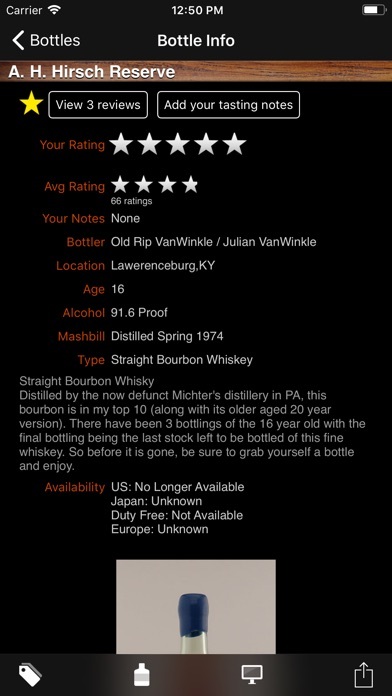 This is a very fun app to look up bourbons and see reviews when buying. An updated list of bourbons would be very nice since many of the bourbons I own are not on the list. I really enjoy this, good info and opinions. I am a bartender , and In love my job . This app is an amazing App which helps you understand more about bourbons , and their flavors. Just FYI - the "mike" who has reviewed the bulk of all bourbons on the site is a member of the KY Bourbon Hall of Fame and the unofficial bourbon historian of the the state. He has almost assuredly tasted (and reviewed) all the bourbons that contain his notes. Through this app we can all benefit from his experience and knowledge! Seems like every time I open the app it has different bottles listed that I want to try or own. Makes the app useless for keeping track of that information. Also there are several bourbons that are not on the list. This App has great potential but really needs to be updated. It is missing a lot of great whiskeys. No Devils Cut!?! PLEASE UPDATE! Helpful .... Use it when I go to the state store , here on Pa.
Easy to use and with mostly helpful reviews of most of the major bourbon producers and covers several of the hard-to-find pours as well.